Well - calling it a network center may be stretching it a bit. It does however have every item of a network center like: WAN connections, routing, switching, server, storage, cooling aka coolness. All that needs to be added now is UPS power. The whole setup. Hidden behind the door to the hallway. Some day I may place a small screen at the floor, as some visitors (of the female persuasion) have complained about too many wires, and too much mess, when the door to the hall way is closed. 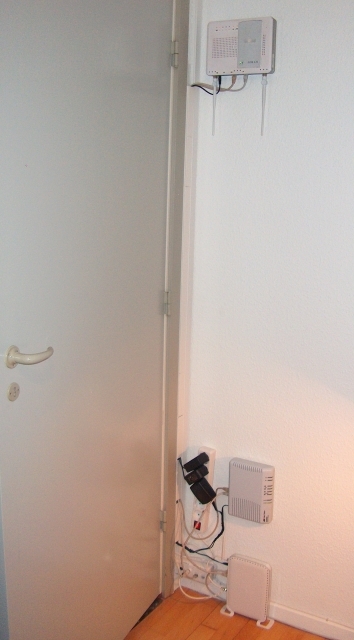 For now I'll however just use the door to hide the "mess"
A modded ASUS WL500gP V1 router - running DD-WRT. High on the wall is the main WiFi connection. 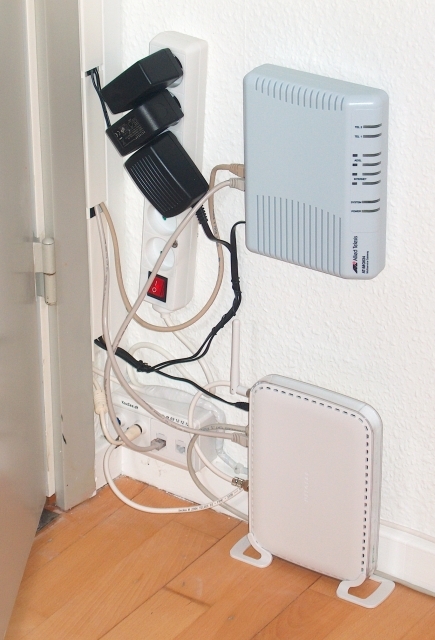 The router is placed with the wire-connections pointing down, to avoid connection problems due to dust collection in the sockets. and as such also functions as a small NAS device. The building network connection sockets/options are placed on the wall near the floor. For the Cable connection the cable company (YouSee) use a Netgear Cable modem. For the WAN connection, the ISP (A+) use a Home-Gateway from Allied Telesis. With the whole setup using about 26 watts. Obviously I do not have the 20Gbps options for both ISPs. Currently the fall-back option is only running a 512mbps connection (cost ~ US$11 a month), to provide basic e-mail and surf options during drop-out on the main line. I have the WAN side of the ASUS router connected to the Home-Gateway. The LAN side of the two routers are connected to each other, to form one LAN with two IP-gateway options. Only one of the built-in DHCP servers of the Asus or Netgear routers are enabled, so all pc's share the same LAN IP segment. Currently you manually have to switch IP gateway numbers. Some day I hope to be able to setup DD-WRT to automatically route between the two ISPs, or at least use one ISP as the default route, and automatically use the other route as a fall-back option. I think I saw a tutorial about that on the dd-wrt wiki, so this may be an option that's too far into the future. I may switch the backup ISP to be with a friend of mine who is living in the next block. 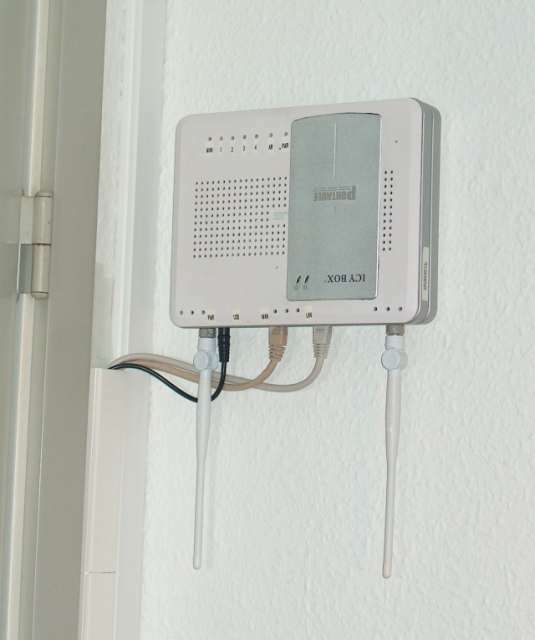 She has a combined ADSL-VoIP deal, and is thus using a different ISP and a different set of wires leading to the world - also it is possible to make a WiFi bridge/link between the two apartments. I know that some day I will set it up - even if for no other reason than - just because we can. I still need an off-location backup drive mounted somewhere. Preferably on a different continent / in a different town / different building / different room. One of the advantages to building in concrete, is that fires basically do not spread from one apartment to the next. Since 2002 there has been something like four apartments that have been completely burned out, with no or very little effect to neighboring apartments. Smoke caught in the stairway, and the smell of smoke spreading to anything organic in the apartments above the fire, seem to be the extent of the problem. So I may just settle for placing a backup drive in the basement.